As of today, we’re proud to announce that we’ve joined the Black Box Bookings roster of bands. This means it will be easier to book us for European shows, so don’t hesitate to get in touch. More info and contact details here. This morning we got some airtime on national channel TV4 where journalist Fredrik Strage talks about Corpus In Extremis. There’s also a short live clip from OEF 2007 for your amusement. …we’ll hit the stage at Klub Gwint in Bialystok, together with Birdflesh, Parricide and Incarnated. In other words, not a show you want to miss out on. We’ll bring some new merch to the show. See you there and bring the gore! Alright, the LP version of the split with Bucher ABC is finally out. As we really cannot put into words how awesome this looks , here’s a picture of this limited edition beauty. Please note that we won’t sell this release ourselves (aside from bringing it to selected shows), so get in touch with the email address below to order. The bloody battle between swedish Gore Grindcore surgeons & japanese Gore Death Metal butchers is here! 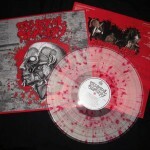 A merciless audio carnage served on splatter vinyl limited to 1000 copies worldwide. Gore on it! Ask for wholesale prices. Trades are welcome for extreme and underground Grindcore, Death Metal, Doom and Punk Crust stuff.